Barley: Processing machine for the utmost versatile grain. Barley is one of the ancient grains together with einkorn and emmer wheat, originating in the Fertile Crescent during 8500 BC. In 4200BC barley was already domesticated in Finland and beer from barley one of the first alcoholic drinks, and still going strong, all around the world. Barley flour should be milled after having undergone a cleaning, dampening, conditioning, and polishing process, de-hulling the seed. (This equipment is also available from ABC Hansen.) 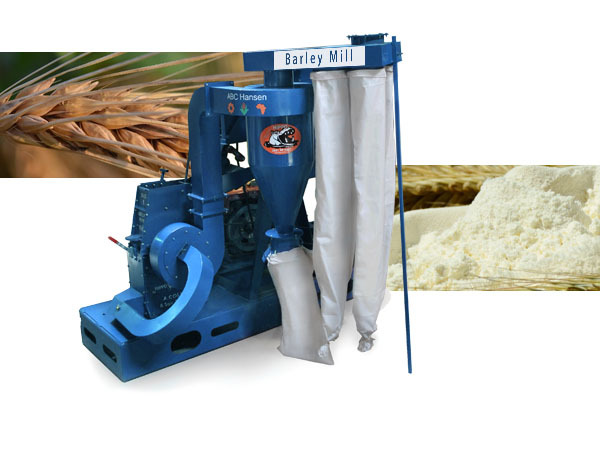 The Universal mill with stone application or a stone mill is a good choice to process whole barley flour. In Scotland barley gruel is widely consumed. Sawiq in Arabia is a similar gruel. Barley soup is enjoyed in during Ramadan in Saudi Arabia and as hamin by Jews on Sabbath and gort in the Cape region of South Africa. It is recommended to screen out all coarse particles prior to packing as barley flour should be fine and not gritty when rubbed between the fingers. Barley flour is may be used as a thickening agent in preparing soups, stews and other gourmet cooking. Organic barley products is usually milled with stone mills. Bran and pollard are by-products of the milling process and bran is added to white barley flour to process brown barley or whole barley flour. While grain barley regulates blood sugar and can improve cholesterol. Barley contains gluten so it is not suitable for the gluten intolerant. Barley pollard is used as a filler for processed meats, soups, stews and many other gourmet products. Barley may also be coarsely milled on a Universal mill with plate application for brewing or other fermentation processed products.